When you give a gift from Broad Street Wines, you give something as distinctive and rewarding as wine itself. Our store is full of interesting and fun wine gift ideas. And if you’re looking for some truly unique wine gifts, talk to us about personalized wine gifts, which make the perfect addition to any home bar. Necessity is indeed the mother of invention. Govino was originally created as a trade tool to help professional salespeople showcase their wines whenever and wherever proper stemware isn’t accessible – which as we learned firsthand, is often! 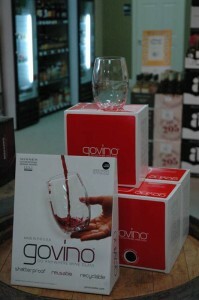 Once we began testing the market, we realized there was an even bigger need for govino in the consumer sector, particularly at settings where breakable glass is an issue. After all, how many times have we all had to endure drinking good wine from bad glasses? Please check back as we continue to add more gift items.